FA Cup: Arsenal vs Mancheter United. steemCreated with Sketch. It is Friday night football, and tonight the two teams tied at 44 points go head to head in the FA Cup knock out round. Both teams had the longest standing rivarly during the Ferguson and Wenger era which has slowly faded due to the turmoil both clubs have been under over the past 5 years but for some even longer. 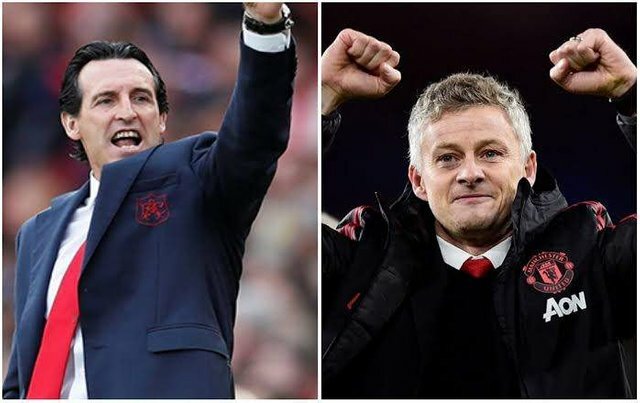 Today, Manchester United travel to Arsenal's backyard on the back of a 7 game winning streak under Solskjaer. Despite that excellent run of form United are weary of an Arsenala resurgence after they beat Chelsea in the league 2-0 with a strong performance backing the score. However, in that match they lost the speedy Bellerin who was strong in that match. He will be a big miss for Arsenal because they have very few options in right full back. Manchester united team news shows that De Gea has been rested for this game in favor of Romero who is taken as the cup goal keeper. However, many fans expected De Gea to sart in such a big match but Solskjaer has placed his faith in his number two goal keeper and so should we. Since Solskjaer has already indicated that he will be making two changes for this game I would imagine two of the main places he would make those particular changes is at the attack and at the back in defence. In attack I am going for Martial, Rashford and Sanchez. I would also start Lingard from the first minute and bring on Sanchez as an impact substitute if all is not going well. In the midfield, I would name an unchanged side with Pogba the first name on the team sheet, Herrera and Matic to hold in the center of the midfield. Finally, in defence, I would make a single change to bring on Eric Bailly over the calamity that is Philip Jones for that tenacity and for the mere fact that he handled Aubameyang very well in the league in our last encounter. Next to him I would have the resurgent Lindellof and Young and Luke Shaw in left and right back. In goal, the decision has already been made. Sergio Romero, who remarkably has several clean sheets under his belt than not, makes it ahead of De Gea. However, he is capable of the odd error or two in a match and fans will probably be looking for him not to cost us the match against Arsenal. This is really a tough match on paper. It could really go either way but backed by the recent form we have been on under Solskjaer I am going for a thumping 3-1 win for Manchester United. @deniskj purchased a 7.16% vote from @promobot on this post.